DUMBARTON succumbed 4-2 to second-placed Raith Rovers at the Bet Butler Stadium, but gave them a real fright in the final minutes. DUMBARTON succumbed 4-2 to second-placed Raith Rovers in front of an 843 crowd at the Bet Butler Stadium, but gave them a real fright in the final minutes. The first half was fairly even, with Mitch Megginson coming close with an early chance. However the only goal of the half came at the other end after 17 minutes when Calum Elliot beat several defenders before netting. The woodwork was hit at both ends. After the break Sons went 3-0 down when Greig Spence converted a penalty on 56 minutes, and soon after defender Dougie Hill headed home. Raith seemed to have the three points in the bag, but then came a late fightback by the home side. Bryan Prunty took advantage of a slack passback to net Sons opener in 90 minutes, and moments later he was pulled down in the box by a defender who was sent off, then converted the spot kick. Sons rushed forward to try to grab a last gasp equaliser, but instead possession was lost at the edge of the Raith box, they were left exposed at the back, and Lewis Vaughan made it 4-2 with the last kick of the match. 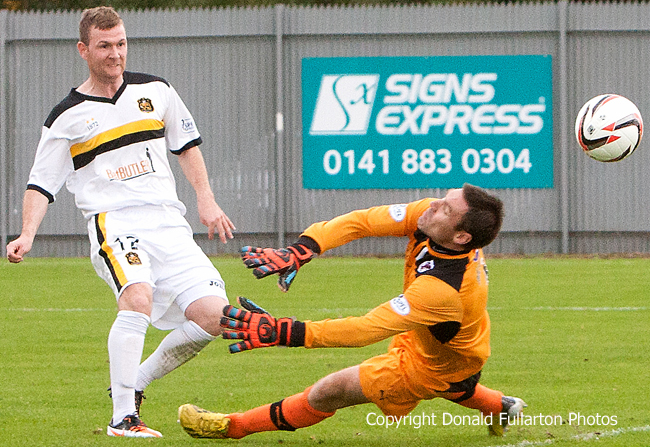 The picture shows Bryan Prunty beating keeper Dave McGurn for his first goal.